Beat egg whites to soft peaks. Add sugar as you beat to stiff peaks. Add vanilla, then melted chocolate chips and walnuts. Cover cookie sheet with parchment paper and drop batter by teaspoons onto sheet. Bake at 350° for 12-15 minutes. Note: These easy, delicious cookies have no flour – so they are ideal for a gluten-free diet and also make a wonderful Passover treat! In a saucepan over low heat, warm the milk and chocolate together until the chocolate is completely melted. Meanwhile, whisk together the egg yolks and sugar until they become pale yellow. Add the cornstarch, salt, cayenne, ground clove, cinnamon and vanilla and whisk until smooth. Slowly pour the warm chocolate mixture into the yolk mixture until combined. Return the mixture to the saucepan and cook over medium heat until it thickens and begins to bubble slightly, around 7-8 minutes or just a touch longer. Remove from the heat and stir until smooth. Pour into pie crust. Cover with plastic wrap and place in the fridge for several hours or overnight. To make the whipped cream, beat heavy cream on high using an electric mixer or stand mixer fitted with the whisk attachment. After 1 minute, add sugar, vanilla, cinnamon and bourbon and whisk on high until stiff peaks form. Spread whipped cream all over pie. Decorate with additional chocolate curls or a dusting of cocoa powder if desired. Heat oven to 350°F. In 1-quart heavy saucepan, cook butter, whipping cream and brown sugar over low heat, stirring occasionally, just until butter is melted. Pour into 13x9-inch pan. Sprinkle with pecans; top with sliced apples. In large bowl, beat cake mix, water, oil, eggs and apple pie spice with electric mixer on low speed until moistened, then on medium speed 2 minutes, scraping bowl occasionally. Carefully spoon batter over apple mixture. Bake 41 to 47 minutes or until toothpick inserted near center comes out clean. Cool in pan 10 minutes. Loosen sides of cake from pan. Place heatproof serving platter upside down on pan; carefully turn platter and pan over. Let pan remain over cake about 1 minute so caramel can drizzle over cake. Remove pan. In small bowl, mix frosting and whipped topping. Serve warm cake topped with frosting mixture and drizzled with caramel topping. 1.Preheat oven to 350 degrees F (175 degrees C). Grease and flour a 9x9 inch pan. Combine the flour, baking soda and baking powder; set aside. 2.In a medium bowl, cream together the sugar, butter and eggs until smooth. Add the flour mixture and beat until smooth. Finally, stir in the sour cream and vanilla. In a separate bowl, combine the nuts, confectioners' sugar and cinnamon. 3.Spread half of the batter into the 9x9 inch pan. Sprinkle a layer of the nut mixture, then spread the remaining batter and top with the rest of the nut mixture. Spread the melted butter over the top. 4.Bake for 1 hour in the preheated oven, until cake springs back to the touch. Preheat oven to 350 degrees. Grease a 9 inch springform pan or pyrex dish for baking. If using a springform pan, cover bottom in foil and place on a flat baking sheet to avoid spills. Bring a large pot of water to boil. Cook noodles around 8-10 minutes. Drain and set aside. In a large bowl whisk together eggs, cinnamon, nutmeg, vanilla, salt and brown sugar. Add sliced apples and mix gently until coated completely. In a separate bowl, mix the flour, oats, brown sugar, cinnamon, nutmeg and salt. Add the margarine or butter and using a pastry cutter or two knives, cut into the dry mixture until even, coarse crumbs form. When noodles have been drained, add to egg mixture and mix gently until coated completely. Pour mixture into prepared baking pan. Sprinkle crumb mixture evenly on top of noodles. Preheat the oven to 325˚F / 170˚C. Heat the oil in a frying pan over a medium flame. Add the onions and saute them for 15 minutes, until they are light brown. Layer in the zucchini and then the broccoli and cauliflower. Cover the pan and let the vegetables steam for 10 minutes. Transfer everything to a large bowl. Add the eggs, cottage cheese, salt, and pepper to the vegetables in the bowl. Mix well and place half the mixture into a large casserole dish. Sprinkle with half of the shredded cheese. Then pour in the rest of the mixture. Cover the dish loosely with foil and bake for 45 minutes. Remove the cover and sprinkle the rest of the cheese on top. Continue baking (uncovered) for another 15 minutes, until the cheese is melted and bubbling. Serve immediately. The following recipe is courtesy of Hovav. Chirshi is a well-seasoned Libyan pumpkin paste traditionally served as an appetizer accompanied by thick slices of simple challah bread. The secret of this dish is to maintain the incandescence of the pumpkin by avoiding overcooking or overseasoning it — but seasoning should nonetheless be applied generously to the dish, as we are ardent supporters of dominant flavors. 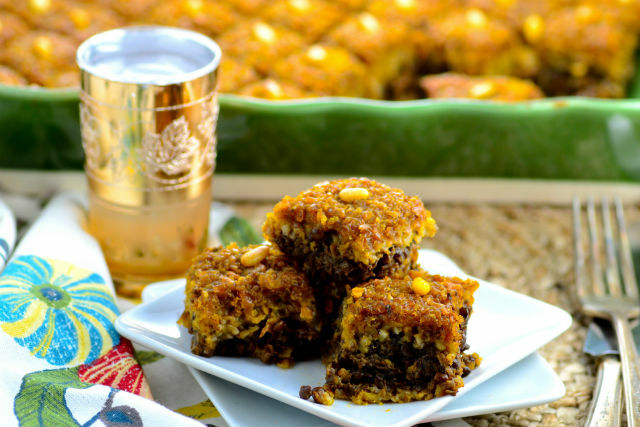 Therefore, although normal quantities in Israeli cuisine are of rather flexible nature (for Israelis are notoriously disobedient), it is important to strictly follow the quantities and preparation instructions provided in this recipe. 1. Cook pumpkin, sweet potato and carrots in boiling water until carrots are soft and let rest in the colander to rid of any excess water. 2. Roughly mash the vegetables using a fork (not a food processor!) together with the remaining ingredients. Leave a few chunks. 4. Serve hot or cold with plenty of fresh bread. 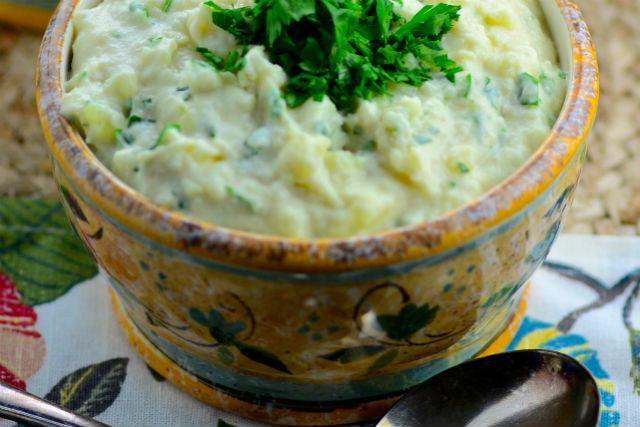 Forget the cream or non-dairy substitute to make creamy, dreamy mashed potatoes. Tahini will achieve the same smooth texture while adding a unique, nutty flavor. Unusual and absolutely delicious! Bring water to a boil and add 1 tsp salt. Reduce heat to medium and continue cooking for about 30 minutes, until potatoes are soft (we recommend checking after 20 minutes). In the meantime, prepare the tahini sauce. Place tahini in a medium bowl. Add 1/2 tsp salt and ice water, 1/4 cup at a time, whisking very well after each addition (the tahini will thicken after the first addition, but it will loosen up when you add more water). When the potatoes are soft and still warm, mash them slightly. Add tahini, 1/2 tsp salt (optional, to taste) and whisk until creamy. Whisk in parsley and/or sesame seeds. There isn’t Thanksgiving without green beans. Just forget about the mushy casserole and try this instead! 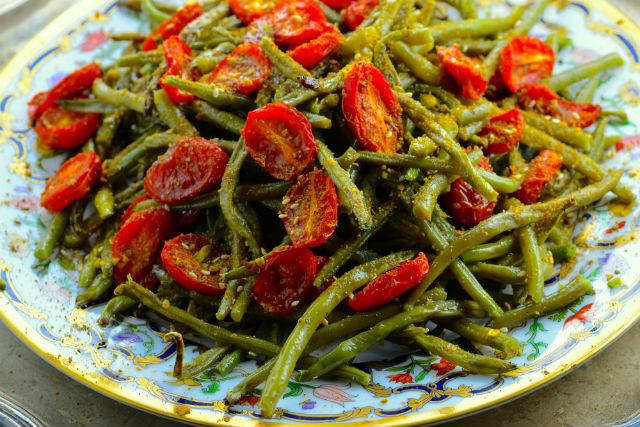 Roasting the green beans gives them a nice chewiness that pairs well with the juicy roasted tomatoes. As a finishing touch we added the Egyptian, nut seed and spice mixture dukkah. Click here for our homemade dukkah recipe though you can also buy dukkah in specialty spice shops or online. Place green beans on one baking sheet. Add 3 tablespoons of olive oil, 1/2 tsp salt and 1/8 tsp pepper and mix until well coated. Place cut tomatoes on the other baking sheet, add 1 tablespoon of olive oil, 1/2 tsp salt and 1/8 tsp pepper. Mix until well coated. Place both trays in the oven (green beans on the top rack and tomatoes underneath). Combine both in a large serving platter and sprinkle dukkah right before serving. To make the kibbeh dough: In a large bowl, combine bulgur wheat and boiling water. Cover it with a plate and let it sit for 20 minutes. Add salt, baharat, cinnamon and pumpkin and mix well. Add flour and mix well to form a dough (the dough will be wet). To make the filling: In a small bowl, whisk olive oil and tomato paste until well incorporated. Transfer to a large skillet and cook over medium heat for 3-5 minutes, until it becomes dark red, stirring often (keep an eye on it so it doesn't burn). Add onions and mushrooms to the skillet and mix until well coated. Add salt, baharat and cinnamon. Cook over medium heat for about 20 minutes or until mushrooms are fairly dry. In the meantime, cook lentils in a small pot with 4 cups of water and 1/2 tsp salt. Bring to boil and cook over medium for about 30 minutes or until the lentils are cooked, but have a slight bite to them (Please note that the cooking time for the lentils will depend on the type of lentils used. We recommend checking after 20 minutes). To assemble the kibbeh: Preheat oven to 375 degrees F.
Drizzle 1 Tbsp vegetable oil at the bottom of a 11x7x3 rectangular baking dish and spread evenly using your fingers. Press a little less that half the kibbeh dough on the bottom of the baking dish. Prick the kibbeh all over with a fork, Spread the filling evenly on top. Divide the remaining dough into 10-12 balls. Gently flatten each one with your hands and place them on top of the filling, until it's completely covered. Score the top dough to make a diamond pattern and garnish each diamond with a pine nut. Drizzle the remaining 2 tablespoons of vegetable oil on top and bake at 375 F for 45 minutes.